There was a lengthy article regarding Havre schools. School board members were making preliminary plans to establish a junior high school, primary grades were being reorganized, and the high school classes would be able to satisfy state requirements. Havre farmers were being encouraged that the 1917 crop was “not a total failure” despite a drought. This would be the beginning of a prolonged dry spell and impending doom to crop prices in the future, unbeknownst to everyone involved. Horse thieves were also active in Havre, making off with four horses from one resident north of Havre, and another horse was stolen while its owner was in a shop conducting business on the streets of Havre. The culprit, or culprits were unknown and the Sheriff was out looking for them, but suspected “a startling nature in connection with the matter”. “Mr. and Mrs. J. H. Hall are guests in Havre of their son, Attorney C. E. Hall. They have been touring Glacier Park, and arrived by auto from there Thursday. Mr. Hall is a member of the state railway commission. 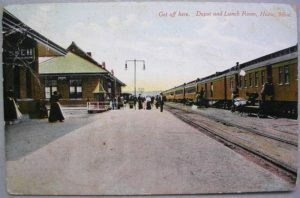 Havre Depot, where the ladies of Havre hosted a farewell celebration for the first set of soldiers going to fight in World War I from the area.